Oreland Joe is world-renowned for his work in stone and bronze sculpture. His works can be found in private, corporate, and museum collections in the United States and abroad. 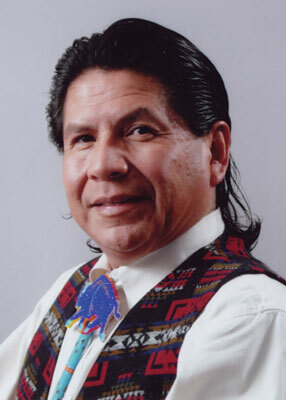 Oreland Joe was born in Shiprock, New Mexico on June 3, 1958. He is a native of New Mexico and is of Diné (Navajo) and Ute descent. He grew up in the four-corners area most of his life, both on the Navajo and Ute reservations. Currently, Kirtland, New Mexico is home to his family and studio. Oreland Joe knew, by the age of four, he wanted to be an artist. As a young man, he experienced various influences that have formed the man who commands admiration and respect in today’s contemporary art world. The most important influences Oreland Joe had throughout his life include his family – his father, mother, grandfather, and teachers. These individuals provided encouragement, support, and the inspiration to grow his artistic talents. He found his father’s work as a silversmith and painter, his mother’s musical talent, and his grandfather’s participation in traditional songs and dances provided him with cultural inspiration and appreciation for history. These experiences provided Oreland Joe with a rich and viable life which is the catalyst that has spun his ideas, images and creativity into a successful career. Oreland Joe’s works in bronze have proven to be just as popular as his works in stone. Orland primarily works with marble, alabaster, and limestone. While in France and Italy in 1978 and 1984, Oreland Joe was able to capture, in heart and mind European art and culture. Seeing and feeling the impressive artistic works of the Greek, Roman, Renaissance and Baroque periods provided another dimension to Oreland’s artistic life. A constant study of the sculpture of Italy, France, Japan, England, and Egypt continues to enhance Oreland Joe’s work. Researching and working with ideas and depictions of Native American lifestyles, songs, and dances of the 1800-1920s has always been a favorite pastime as well. Images from this time span continue to give Oreland Joe a sense of home. In 1993, Oreland Joe received the distinct honor of becoming the first Native American artist to be a member of the famed and prestigious organization “Cowboy Artist of America.” This honor launched Oreland to new heights in his career. In 1996, he was chosen out of 50 artists by the Ponca City Native American Foundation to produce a twenty-two foot bronze sculpture of “Chief Standing Bear.” It is Oreland Joe’s crowning achievement to date and his most public artistic statement. 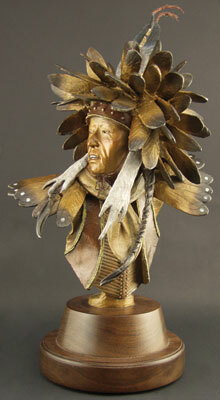 Oreland Joe’s love for art has placed him in an elite class of stone and bronze sculptors known throughout the world. In spite of all his accomplishments and ever-growing popularity, Oreland Joe remains humble, sensitive, and grateful. He still finds time to teach others at his studio or workshops. He continues to be “down to earth” as the foundation that sustains him is still derived from his family, good friends, and Creator. He serves as a great role model for all young people. This article was excerpted from Canyon Road Arts: The Complete Visitors Guide to Arts, Dining and Santa Fe Lifestyle, Vol 3, 2007-2008, pages 122-124. Canyon Road Arts is published by Medicine Man Gallery. All rights reserved.